First Account of the Excavations of Lochrutton Crannog. By Mr James Barbour, F.S.A., Scot., Architect. The transactions of this Society of 1863 and 1864 give prominence to the class of structures known as Lake Dwellings or Crannogs, and the addresses of the president, Sir William Jardiue, contain much of interest regarding them. Several were visited, and in two instances exploratory operations also were instituted. The crannog at Corncockle was cleared by the president, when quantities of smashed bones, evidencing occupation, were found, aud at the Black Loch of Sanquhar, the water having been run off, a section was cut through the crannog down to the bottom of the loch, fully disclosing the design. No relics, however, of chronological import, or bearing on the civilisation of the occupation, were discovered iu either case. Another like structure, situated at Friars’ Carse, examined by Dr Munro, is described in his valuable work, “Ancient Scottish Lake Dwellings or Crannog's.” These seem to be the only instances of systematic investigation overtaken in the district in connection with such structures. 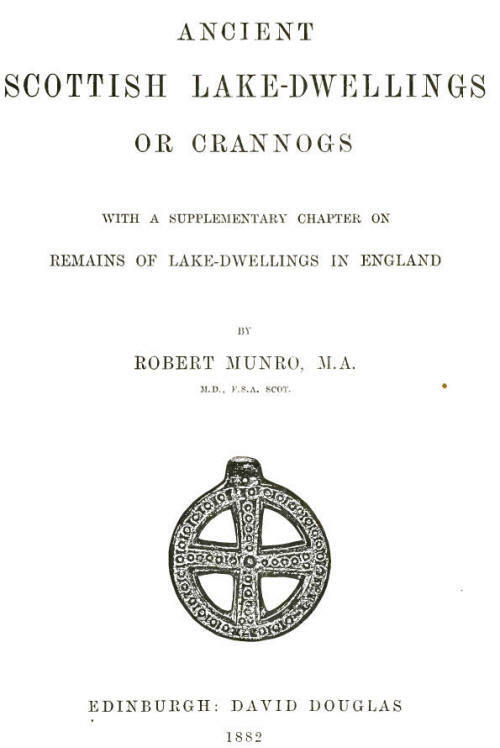 Tabulated in Dr. Munro’s book are the following crannogs in the counties of Dumfries and Kirkcudbright, viz. :—Lochmaben, Black Loch of Sanquhar, Friars’ Carse, Loch Orr, Lochwood, Closeburn, Corncockle, Morton, Lochrutton, Loch Kinder, Car-lingwark, Lotus Loch, Barean, Borgue, and Loch Fergus. Last year the Society resolved to institute exploratory operations, selecting Lochrutton crannog for examination. Several circumstances lend themselves to mark it out as one of some importance. The loch is of large area and deep. A peninsula on its east margin is served from the mainland by an artificial ditch and rampart drawn across the neck; and so forms au island about an acre in extent; and about 300 yards distant from the north end of the loch there is a large camp or moat from which the farm of Moat derives its name. The site of the ancient castle of Auchenfranco also lies at the south-west corner of the loch, and at a distance of little over half-a-mile to the south-east stands Hills Tower, tall and picturesque, and, thanks to the care of the proprietrix, well preserved. The crannog and a small natural island, named on the Ordnance Map Dutton’s Cairn, appear as wooded specks on the surface of the loch. The loch lies 305 feet above sea level, measures nearly a mile in length from north to south, and half-a-mile in width, and extends in area to 125 acres. The principal feeder is at the south end, the outfall being opposite, with a rock bed not liable to change. The crannog is 230 yards distant from the peninsula ou the east shore the nearest point of the mainland ; 190 yards of water separates it from the natural island, which again is 90 yards distant from the west shore of the loch. It is not a little remarkable that the crannog occupies a position as exactly as may be in the centre of the loch’s area, so that notwithstanding its diminutive size, being divided by the medium filum, the eastern half belongs to the proprietor of Hills, and the western to Auchenfranco. In regard to the depth of the loch, the soundings round the crannog show a nearly level bottom with 11 to 13 feet of water. Half way between the islands the depth increases to 35 feet, and 140 yards to the south of the crannog, the deepest part of the loch, the sounding is 52 feet. 12 feet is the depth between the natural island and the west shore, and between the crannog and the east shore it is 11 feet. The examination of the crannog by pick and spade, although sanctioned last year, could not be carried out at that time owing to the high level of the loch. The peninsula or outer island was, however, partly examined by sections through the artificial rampart and a number of short trenches in the interior. In the beginning of September last the exploratory works were proceeded with on the crannog, two workmen being employed, and operations continued during three weeks. Considerable progress had been made, when, unfortunately, following on rains, the level of the loch again rose, and ultimately reached a height which rendered postponement of the completion of the investigation imperative. The crannog when approached presents the appearance of a low circular cairn of stones resting on a foundation composed of logs of wood, and rising’ from the water level with a slightly rounded section to a grass-covered plat in the centre. A row of alders, doubtless sown with seeds carried there on the water's surface, encircles the plat, and marks the winter level of the loch. The crannog measures eighty feet in diameter, and the centre plat rises six feet above the log floor. The work overtaken consisted in carrying a wide section across the crannog in a direction approximately north and south, down through the superincumbent earth and stone to the wood floor of the structure. Another similar section followed, in a direction at right angles with the first, and the excavations were continued in the interior. After considerable advance had been made, the influx of water began to impede operations, and ultimately reached a height making further progress impossible. The ends of the sections were then closed with earth and a pitching of large stones, and the works ceased for the season. These exploratory excavations have disclosed more fully the characteristics and structural arrangements of the island, and some vestiges, it is thought, of the superstructure or dwelling-house have been brought to light. Relics have also been recovered bearing on the character and era of the occupation. The sections disclose the strata from the top of the centre plat downwards to the wood floor. There is first turf and free soil about eighteen inches thick, then comes another layer of soil of similar thickness, but more compact and changing to marl or clay at the bottom. Below the second bed a quantity of whin-stones, unshaped and disposed without order, the intertices being filled with marl coloured earth, lies on wood floor. The layer is three feet thick in the centre, but towards the margin it tapers down to the wood. The surface of the island supporting these strata exhibits a comparatively level floor, composed entirely of logs of wood disposed in groups of parallel pieces, lying in many different directions and fitted closely together. The logs, measuring six inches to twelve across, are mostly round, and sometimes retain the bark, but a few are squared in whole or part. Oak, birch, and other woods obtain. Round the exterior of the island a rough banking of tumbled stones slopes outwards into the water, and among the stones are numerous timbers lying without order, and apparently displaced from their original position, as if the outer fringe of the Crannog were broken down. It has been ascertained that to a depth of five feet from the floor the construction consists of layers of logs alternating with thin beds of stones, and this method probably continues downwards to the bed of the loch, as was proved by Dr Munro to be the case at Lochlee Crannog-. It seems, as the timbers would be self-carrying, the most appropriate in the present instance, considering the distance of the Crannog from the mainland and the depth of the water to be crossed. The groups already described as forming the floor are very suggestive of rafts, which might have been put together on the shore and floated thence to the island and into position. Morticed beams such as are common in structures of the kind have not been observed in situ, but detached pieces of this description are found. The island was probably stockaded, like the Lochlee Crannog, but the morticed beams have disappeared by decay and the action of the waves as the structure began to sink. At a distance of about four feet from the exterior margin remains of a number of oak posts, three inches to six inches in diameter, project above the surface of the floor, and appear to have formed part of the stockading. The posts are pointed and driven into the floor 1^ feet to 2A feet, and the points have evidently been shaped by means of a sharp axe. In the interior small oak branches similarly pointed are found driven between the logs, as if intended to secure them in position. The log floor now scarcely rises above the summer level of the loch, and the winter level, as it is indicated by the wash and the lime where vegetation begins, is considerably higher than the floor, shewing that sinking or shrinkage has taken place. The amount of the depression is probably as much as five or six feet, and as the bed of the loch consists of debris of rock not likely to yield much from the weight, the subsidence of the structure has, it may be conjectured, arisen mainly through the compression of the materials of which it is built. These are the general, and no ways exceptional, features of the structure. On it would doubtless be raised for the shelter of the inmates some sort of dwelling-house. The superstructure, however, being particularly exposed to destruction through natural decay and in other ways, has, as might be expected, disappeared, leaving hardly a certain trace of its existence. Whether built mainly of stones or of wood cannot certainly be known. The large collection of stones heaped on the floor of the Crannog is possibly debris of a stone-built house. Of wood debris there was found embedded among the stones several pieces of oak, one morticed, one squared and holed for the reception of a stout pin. Another lay on the log floor apparently in situ. It is squared, or nearly so, clean cut across the ends, and rebated as if intended for the reception of uprights, one of the rebates being pierced with a pin-hole, and the upper face shews a long groove 4 inches wide, 4 inches deep, and 26| inches in length. The piece measures 10£ inches by 8 inches across, 4 feet 2 inches in length, and 3 feet 4 inches between the rebates. Evidently it belongs to the superstructure, and probably served as the threshold of the door. That the wood vestiges are meagre is not surprising, as whatever of this material the building contained was liable to be carried away. Judging from analogous structures elsewhere in Scotland, the probability is that the original house was constructed of wood. The relics recovered during the excavation of the Crannog shew less variety of objects aud a more limited range of occupation than those from some of the other structures of the kind; on the other hand, the character and period of the occupation are, perhaps, better defined than is usually the case. The loch has been and is resorted to by anglers, curlers, and others, who would doubtless often use the Crannog as a retreat and rest, and so it has happened that the upper stratum of earth yielded articles of recent date. Ou the top of the centre plat some stones formed a hearth, over which lay peat ash and a quantity of peats, and in the surface mould was found a small leaden bullet, two penny pieces of the reign of Queen Victoria bearing date 1861-66, fragments of glass bottles, pottery, and tobacco pipes. One of the “finds” consisted of the base of the bowl and shank of a curious example of the last-mentioned class of objects, which probably belongs, Dr Anderson suggests, to the 17th century. The relics and evidences relating to the occupation were recovered from among the stones overlying the log floor, and at a depth of not less than three feet six inches below the turf of the centre plat. Food refuse is plentiful, such as bones of animals and birds, which, however, having been burnt, are, except a few, indistinguishable. Of the latter are teeth of the ox. a boar’s tusk, bone of a bird, and a fragment of deer’s horn. There is also a piece of the jaw of a rodent not much larger than a rat. Shells of hazel nuts are found. Charcoal is abundant, although no hearth has yet been discovered. Pottery is the predominant article of the relics. Over 170 fragments were found, mostly very small, but showing variety of material, make, and form of vessel. It consists of blue, red, and black metal, almost all wheel made, and, with the exception of a few pieces, it is glazed chiefly with a greenish or yellowish green glaze. Brownish glaze and brownish green glaze are also found. Several pieces are roughened by pounded grit cemented on them by the glaze. Pieces belonging to several vessels are marked with herring-bone ornamentation, others with vertical projecting ribs and oblique parallel lines, and another form of ornamentation consists of a row of thumb marks round the exterior margin of the bottom of the vessel. There are fragments representing 13 handles of jars and other vessels, also several spouts, one being of tubular form. Some of the jars in addition to the large carrying handles at the back have been furnished with smaller supplementary handles in front of each side of the spout for the purpose of tilting the vessel to a convenient angle to drink from. A variety of other objects were obtained, such as a piece of red pigment, probably hmmatite, three small pieces of sheet lead, some nondescript iron, a large nail, part of the blade of a large knife curving inwards, much rusted, a leaden spindle whorl, a small ring or link of bronze or brass, two fragments of a circular vessel of red sandstone, widening upwards, the bottom flat. The side is 1ô inch thick; the vessel is of fine workmanship, smooth inside and dressed with a sharp point outside. From below the log floor was recovered a small splinter of oak neatly wrapped about with a narrow ligament of skin, probably a fragment of a basket. Only in one other instance has an article of this description been found in connection with a Scottish lake dwelling. An equal armed cross within a circle and decorated on the face was discovered by Dr Munro at Lochspouts. It is figured and described in his book. To supply as before a descriptive sketch of the Crannog and the excavations carried out by the Society, with the results, is the chief purpose of this paper, but it may be proper before closing to submit briefly a few suggestions regarding the significance of the details recorded. The situation of the Crannog in deep water and at the greatest distance from the shore the loch allows is an indication that its primary purpose was to afford security and protection to the occupiers. The existence of the outer intrenched island on the east shore of the loch, which there can hardly be any doubt was associated with the Crannog, is a circumstance not met with elsewhere. The two evidently stand one to the other in the relation of the Base-court and the Citadel of a Mote. At this stage it may be noted that the peninsula or outer island yielded no relics in the interior, but teeth of animals are plentiful along the water’s edge, and in the substance of the artificial rampart already described were found fragments of bone, deer’s horn, glass slag, and nondescript iron or iron slag. Teeth of animals have also been observed on the natural island near the west shore of the loch. The Crannog itself is of a type which is common, and there is nothing exceptional in the structural details it exhibits. The work exhibits judgment in the selection of materials adapted to the circumstances, such as admitted of being grouped on the shore and transported over the water, self carrying being preferred ; and the disposition and method of securing the pieces in the structure is skilfully worked out. The carpentry shows some advance and the use of the more common tools of the craft. The use of sharp-edged carpenter’s tools of itself establishes the circumstance that the crannog does not date back to the stone or bronze ages, and the character of the relics found on it indicate an occupation comparatively modern. No evidence has been discovered bearing on the comparative age of the Crannog and of the occupation. So far as this partial exploration shows, the relics in this case differ from those of the more prolific lake dwellings examined, inasmuch as no stone (except only one disc) or bronze implements, or implements of bone have been recovered, and ancient pottery is also absent. The pottery, however, which is usually not plentiful, is here the most abundant and characteristic of the finds. Dr Anderson considers that the general aspect of the finds as a whole is mediseval, and the pottery is almost all of the fabric accustomed to be classed as 11th to 16th century. Occupation appears to have been continuous, and to have extended over a considerable space of time. The occupants consisted of a family, who, judging by the plentiful and varied food refuse and the abundant and, it may be said, elegant table service of pottery, deserve in all circumstances to be described as opulent; and the cross recovered seems to show that they were of the Christian faith. This is the residence and stronghold of the mediteval Baron, who had not yet built his embattled and moated stone tower. To those who expected evidences of the remote the outcome may be disappointing, but the discovery of conditions and modes of living, but dimly shadowed in history, is a result alike interesting and instructive. Thanks are due to a number of friends, in particular Mrs M'Culloch Jameson and Mr Steel, the proprietors, for permission granted to examine the island ; Dr Anderson, who, as before stated, examined and characterised the relics ; and Dr Munro, who has taken special interest and afforded active help in connection with the work. Mr Barbour exhibited all the relics mentioned as having been found in the course of the excavations.